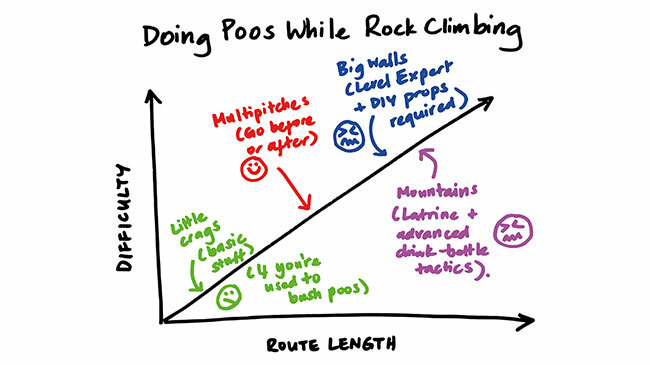 Bogong Blog - Where Do Rock Climbers Poop? Sometimes you just can't hold it. Photo: Bogong Equipment. Pooing at the crag can be messy. We've all seen it: a tatter of bog roll strewn barely a metre from the track. And, perhaps, an unburied lump of turd. There are right ways and wrong ways to go about your 'business' at the crag. Here's a rundown. Don't go to the toilet where people are belaying. Don't go where people are (or are likely to be) hanging out. Choose some place a bit away from the action – both for modesty and sanitary reasons. If the cliff area is very cramped, or there's no soft ground for burying poop, it's best to head back down to the carpark toilet. If you're doing a three- to five-pitch climb, go (at a toilet block, or in the bush) before you start. The problem with weeing or pooing halfway up the cliff is that, especially on well-trafficked routes, parties tend to belay in almost exactly the same spot. Leaving a hot, brown present in these places – where belayers hang around for a fair amount of time – turns a pleasant experience (barefeet hanging over the edge of a precipice, wind in your hair, staring across the Wimmera...) into a downright nasty one. Don't do it. In Victoria, the only place you're likely to do a multiday climb involving a portaledge and a night or a few on the wall is Mt Buffalo. Still, you might have decided to aid Ozymandias (270m, M4), which most climbers take two to four days to complete. Urinating and defecating while you're 100 metres up a rock face is tricky. Peeing in the wind, or just dropping one off the side of the portaledge has clear consequences: A) because you never know which way the wind is blowing, and B) for the obvious reason that there could be somebody below. However, peeing into a container is problematic. Unless, you're happy to carry litres and litres of wee out with you. This isn't really an option if you're on the wall for four to five days. So, general advice: Try to be discrete. Try not to pee down the route. Women: a device like the Go-Girl Wiz Biz makes weeing from a portaledge easier. Basically, it's a soft funnel that helps direct flow if you want to wee standing up. It's made of medical-grade silicone, and it's flexible so you can stash it in its storage tube when it's not in use. If you're planning a Yosemite trip and you really don't want to wee on the wall, we can order in Wag Bags. These are plastic bags with what are essentially crystals like kitty litter, which absorb your wee. For Number Twos, Google "How to make a poop tube". Essentially, a poop tube is a piece of PVC piping with a solid cap on one end and a threaded cap on the other. (We recommend you tie a length of cord to the cap, so you don't lose it.) 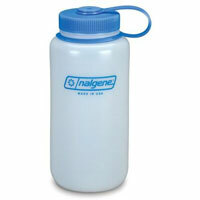 For shorter trips, you could use a wide-mouth Nalgene bottle (which you would never use for drinking EVER AGAIN). How to use a poop tube: Poo (into a paper bag first, if you like), then drop the poo in the tube. Put the lid back on. If you don't like the idea of a tube of poo swinging around below you, there is also a lighter 'dry bag' option – see 'Method 2,' here. Remember: When you're back from your climb, don't throw any plastic bags into a drop loo – they'll clog the system. Some places, like Denali, require you to carry your poo out (also called 'packing it out'). In other places, some base camps have proper toilets. If you're on the mountain proper, dig a latrine that becomes the designated 'toilet area'. Peeing: Because it's cold and you won't want to get out of your tent, bring a wide-mouthed collapsible Nalgene bottle with a skull-and-crossbones painted on it (1.5L, or 3L if you have a big bladder). Women, a Go-Girl Wiz Biz is handy here, too. If you've got your period, take any used pads out with you and dispose of them properly. Method: Choose a spot at least 100 metres away from a water course. Dig a hole. If the earth is soft, you can use your foot. But, it's much easier (and quicker) with a lightweight trowel. The hole should be at least 15–20 centimetres deep. Do your business in the hole. Deposit used toilet paper in the hole, and bury the lot. You shouldn't be able to see any dregs of used loo roll poking out of the ground or, worse, blowing away in the wind. DON'T burn toilet paper. That's what a tourist did in Chile's Torres del Paine National Park in 2011, and the fire he caused was devastating. Note: If you're using baby wipes, don't bury them. Take them back out with you and dispose of them in a proper rubbish bin, because baby wipes don't biodegrade easily. If you've been climbing in Europe, you may have noticed that an accepted way of going about 'Number Two' is to do a poo and then put a rock on top of it. This isn't the norm in Australia. Bury it. Pocket-sized hand sanitiser helps keep things hygenic. (Think about all the things you'll be handling – rope, snacks...) Hand sanitiser evaporates, which means you don't need to use water. Something like LifeVenture Dry Wash Gel is also anti-bacterial, biodegradable and pH-balanced. In summary: Think hygiene, think leaving as little trace as possible.